The Brooks-Range pro card is a sheet of aluminum with laser etching that lets you quickly size up snow crystals. It has 1mm, 2mm, and 3mm grids on both sizes that have low thermal-conductivity to avoid melting when analyzing. Helpful Rutschblock and CT test guides are imprinted on one side, with crystal terminology on the other. 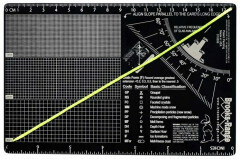 The card comes with a string and angle guide so it also doubles as an inclinometer (the basic grid lacks this feature). 4.5” x 7” in size, which fits in a book or organizer. Comes with instructions. Four Stars for a nicely sized snow crystal card designed from appropriately chosen material with a helpful assortment of grid sizes. The clinometer is helpful for assessing the pitch of your snowpit to ensure that it's broadly representative of the terrain you plan to ski, but somewhat superfluous since far more useful to have a compass with a clinometer that can also sight up or down a slope. The missing star is for the outdated printed info. I know that products like this can't be updated as frequently as the AIARE fieldbook, whose revisions seem to take up half our our all-day instructor refresher course every other year. 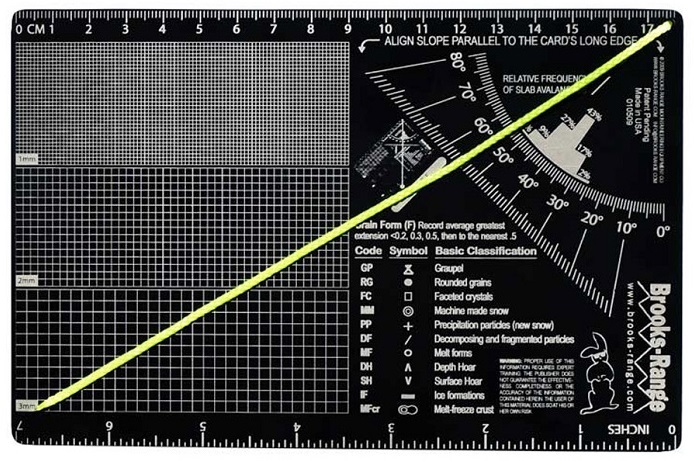 But the info on the front side of the card as shown in the product listing is very limited -- my picture shows how I supplemented it with an overlay from the AIARE fieldbook (although that obscured the clinometer markings). Far worse is the other side of the card, which has testing instructions for RB and CT ... yet no ECT or PST! (The non"Pro" version -- not carried by Skimo Co at the time of this review -- adds in the stuff sack and shovel shear, yet also omits the ECT & PST.) I also added overlays from the AIARE fieldbook on the other side for the ECT & PST, and the card provides plenty of space for that, but disappointing that the printed info here is so outdated.